PSAT for 7-30-13: Tell the big box stores what our children and our schools really need! Not sure why WalMart and Costco need to get involved in our children’s education, but at least Costco is asking what we think about testing instead of just spending billions to force public education into a disastrous direction, as the Walton family has done. Wonder how long it will stay there? Why don’t you try? Posted in Uncategorized | Comments Off on PSAT for 7-30-13: Tell the big box stores what our children and our schools really need! Tomorrow, CPS high school students organized by Chicago Students Organizing to Save Our Schools and VOYCE will boycott the second day of the state high school exam, the Prairie State Achievement Exam (PSAE). The first testing day includes the ACT test, which many students need for college applications. The students are asserting their right to make up the second day test during a state-scheduled make-up test day next month. Watch and share their excellent video. Wear white tomorrow in solidarity. 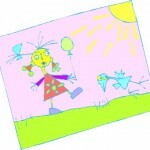 PSAT for 4-16-13: Get out your smocks and get ready to play! For Public Schools Action Tuesday today, you’ll need to get ready for the More Than a Score Play-In tomorrow. Bring your kids and prepare to learn through play. Tomorrow’s elementary school report card pick up for Chicago Public Schools so there are no classes, and we will be done in time to get back to the school for report cards. WHO: Dozens of parents, children and educators working with More Than a Score, who are concerned that testing has taken over the Chicago Public Schools (CPS) classrooms of our youngest children, pushing play-based learning out. WHAT: We will set up play areas at CPS headquarters to demonstrate the power of play. We’ll be telling the CPS Board of Education that we want play back in our schools for all children. We’ll be playing with blocks, bubbles, fingerpaints, musical instruments, trucks, dolls, Play-doh, crayons and paper, puzzles, etc! More Than a Score members will also pass petitions against the misuse and overuse of testing in CPS at the event and later in the day at local schools. WHEN: Wednesday, April 17, 9:30-11am (Brief press event at 10 am). This is CPS elementary school report card pick up day (pick-up begins at noon). WHERE: CPS headquarters, 125 S Clark Street, Chicago. WHY: The youngest learners in Chicago Public Schools are facing multiple standardized tests—as many as 14 in some kindergarten classrooms – inappropriate amounts of seatwork and homework, and a lack of opportunities for play, exploration, and creativity. The combination of the longer school day, an overly academic curriculum for the youngest learners, and high-stakes testing is turning our children’s first learning experiences into an ordeal. Opportunities for true free play are becoming more and more rare in Chicago Public Schools. Posted in Uncategorized | Comments Off on PSAT for 4-16-13: Get out your smocks and get ready to play! PSAT for 3-19-13, Part 2: Come to the testing forum tonight! When: Tonight! March 19! 7 pm! This forum will be crowded, so come early. 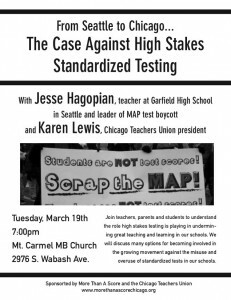 Hear from Jesse Hagopian, leader of the Garfield teacher test boycott in Seattle, a local Gage Park HS student who was part of a recent student test boycott, and our own Karen Lewis. You’ll also hear about some of More Than a Score’s upcoming activities. As we move into high gear with resistance to school closings, don’t forget that standardized testing enables school closing. Posted in Uncategorized | Comments Off on PSAT for 3-19-13, Part 2: Come to the testing forum tonight! 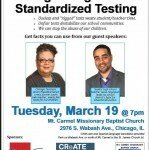 More Than a Score and the Chicago Teachers Union are co-sponsoring a forum featuring Seattle teacher Jesse Hagopian, a leader of the Garfield High School test boycott, along with CTU president Karen Lewis. It will be held on Tuesday, March 19, at 7 pm at the Mt. Carmel MB Church. 2976 S Wabash. The Garfield teachers made national headlines earlier this month when they announced they would not administer the district MAP test. When threats were made to suspend the teachers, the students organized a boycott against the test as well, and in the end, so few Garfield high school students took the test that the results will be useless in teacher evaluation. Come hear more on March 19! Spread the word by downloading and copying the event flyer. Here’s the letter Parents Across America/PAA-Seattle wrote in solidarity with the teachers. Take some time today to listen to PAA’s testing webinar from Sunday Jan. 29 which featured Garfield teacher Sarah Johnson along with FairTest’s Monty Neill and national testing opt-out leaders Tim Slekar and Shaun Johnson. Looking ahead, the following Wednesday, February 6, has been called as a national day of solidarity for the Garfield teachers. 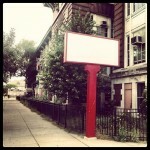 More than a Score has chosen that day for a Chicago citywide testing petition day. Details and resources for petition passers are here. Please add your school to the list of locations for the Feb. 6 petition day.